With the highly anticipated The Darkness video game from 2K just around the corner, Top Cow is releasing a collection of the best of The Darkness to bring fans of the video game into the fold. This video game collection reprints the essential "Coming of Age" origin story arc by Garth Ennis and Marc Silvestri, which introduced the world to Jackie Estacado, the terrible power and curse known as The Darkness as well as reprinting "Resurrection," the critically acclaimed story arc by Paul Jenkins and Dale Keown. Also included in the volume is bonus material for The Darkness video game. 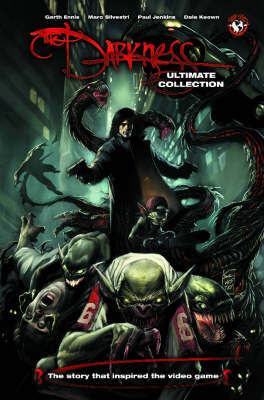 The volume includes first appearances by Top Cow favorites such as The Angelus, The Brotherhood of the Darkness and more.